Andrea Dovizioso won't read too much into the opening three MotoGP rounds, but from what he saw in Qatar Ducati was 'slowest bike' in middle of corner. Never one to jump to early conclusions, Qatar race winner Andrea Dovizioso believes the hierarchy of the 2019 MotoGP world championship won't be clear until at least round five, in France. The Ducati star's reasoning is that the opening events - Qatar, Argentina and Texas - take place on 'strange' circuits and it's only when the European season begins, at Jerez and then Le Mans, that the true shape of the season will emerge. "The Qatar track is very strange so we have to wait I think until minimum Le Mans, because the next two rounds will also be strange tracks," said Dovizioso, who won in Qatar by just 0.023s after repelling a final turn assault by Honda's reigning champion Marc Marquez for the second year in a row. "But from what I can see it looks like everybody is closer. That means when you are in a bad weekend you can lose a lot of points. That's why we have to keep our feet on the ground and continue to work." Analysing the performance of the new GP19 during the desert race, Dovizioso remains concerned that the Desmosedici's long-standing lack of corner speed will hurt them over the full season. "We have some really good points, but in the middle of corner we are the slowest bike," he explained. "Still, we have really good acceleration and power on straight and it gives us the possibility - when the tyre and track is good for us - to make the difference. "But over 19 races still I think we miss something. "But I don’t know because also to understand Honda's situation is difficult. It looks like they have a small advantage compared to last year, because they have more power, but we have to wait to see in different conditions." 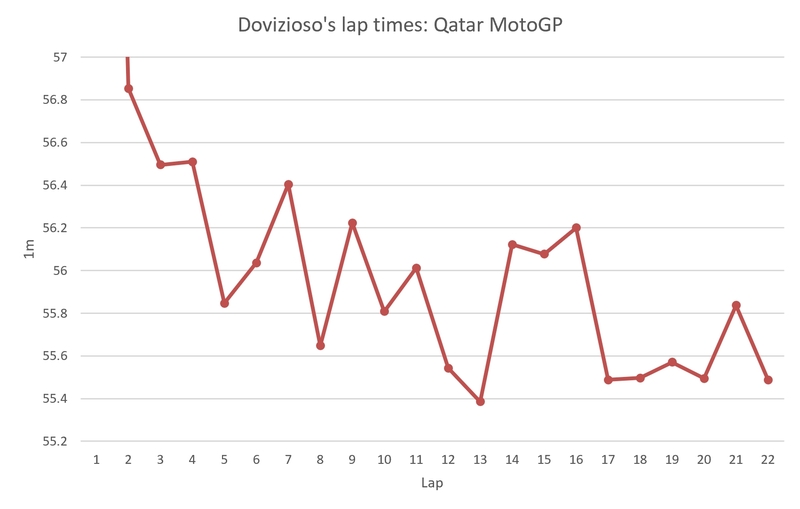 Meanwhile, a chart of Dovizioso's lap times during the Qatar race illustrates how he was able to up his pace by over 0.6s - in the space of a lap - on several occasions. Most notably, Dovizioso went 0.712s quicker on lap 17 of 22, then remained under the 1m 56s to the end of the race. The average of Dovizioso's final five laps was 1m 55.563s, compared with his opening five laps (excluding the start lap) of 1m 56.348s. Although Dovizioso remains listed as the Qatar winner, it is pending the verdict of the MotoGP Court of Appeal regarding the swingarm device fitted to the GP19s for the race.